We are pretty sure 2 person will always remember this date, 24th July 2010. It isn’t something that happens every day and when it does, it is a day to remember. Especially, when the boyfriend enlists the help of friends at the Borneo Dream Travel & Tours agency. Congratulations to the both of them! I don’t think he was too worried about it, it was pretty much a done deal at that point. This shot pretty much says it all. And it happened on the last dive of the day. 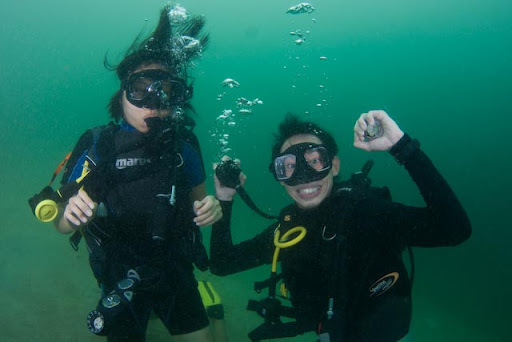 The people they went scuba diving with are the Borneo Dream Travel and Tours. They are very active in the waters around Kota Kinbalu, Sabah. You can also find them on facebook.com. F-G-1 Plaza Tanjung Aru, Jalan Mat Salleh, Kota Kinabalu, 88100, Sabah, Malaysia. This entry was posted on Wednesday, August 4th, 2010 at 5:23 am and is filed under Adventure, Featured. You can follow any responses to this entry through the RSS 2.0 feed. You can leave a response, or trackback from your own site. 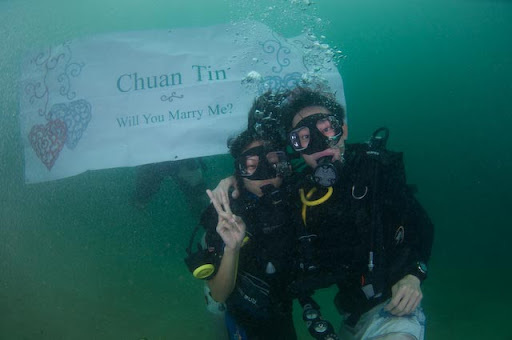 What an amazing way to propose ! There’s just no way she could have turned him down after that, no way. Though it’s only that romantic because it hasn’t been done before, it’d be foolish if people start doing it as a common practice.